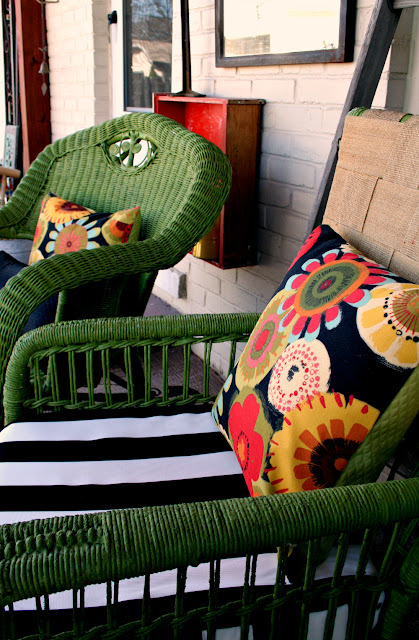 Somewhat Quirky: New Pillows For My Back Porch - March Fab Furniture Flippin Contest! New Pillows For My Back Porch - March Fab Furniture Flippin Contest! It's the third Friday of the month and that means I'm sharing my March Fab Furniture Flippin project. 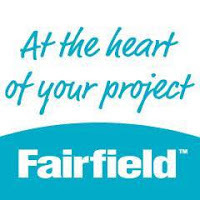 This month's sponsor is Fairfield. Fairfield is one of those companies that might not ring a bell at first, but once you look at their website you realize that you've been using their products for years and years. If you have ever bought batting, foam, pillow forms, interfacing, fillers (like Polyfil) you have probably used their products. I know you will recognize many of the brands under the Fairfield umbrella. Crafters Choice, Nature-fil, NuFoam, Poly-fil, Soft Touch, Toasty Cotton, Weather Soft™, Foamology; I could go on and on. Their products aren't just designed for sewing, quilting, and crafting. They have products that serve the medical, institutional, industrial, audio, & pet markets as well. The theme of the contest this month is "Mix & Match" and I knew exactly what I would do. 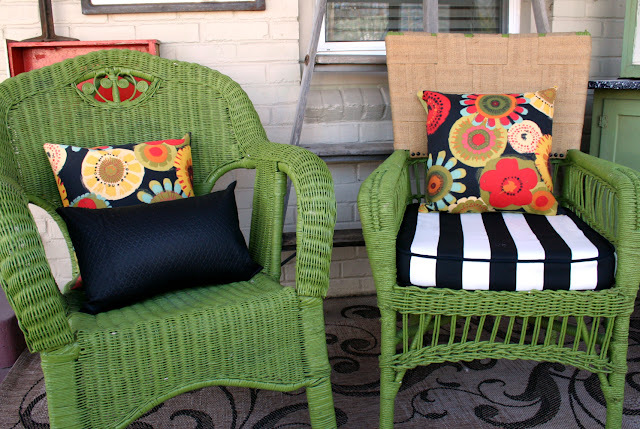 I would get in my fabric closet, pull out the outdoor fabrics I've collected over the past 2 years, and get started on the pillows and cushions I've been wanting to make. Fairfield graciously provided me with 3 of their Weather Soft™ Indoor/Outdoor Pillows. Weather Soft™ Pillows and Cushions remain dry inside thanks to a unique water-resistant shell fabric. A thin polyurethane laminate coats the fabric to prevent water from penetrating into the shell, so the filling stays dry and the outer coverings dry quickly. They also recommend them for use in accident prone areas like the kitchen, nursery and family room. It doesn't make a lot of sense to use outdoor quality fabrics and put them over regular pillows that will absorb and hold on to water if they get wet. At my house the outdoor furniture gets really wet. If I've told you once, I've told you a million times, that it rains a lot here. I have a covered patio/back porch, but not an inch is safe from the sprinkles and splashes when it rains. I don't want to have to wait 3 days after a rain to use the furniture on the back porch. We also have some outdoor furniture that isn't on the covered porch that I would like to have pillows and cushions for. So I was glad to have the opportunity to try out these weather resistant products from Fairfield. 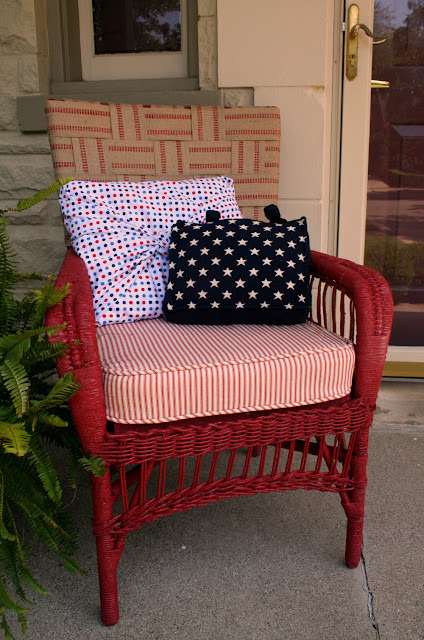 I selected two 16x16 and one 12x18 pillows, and made simple envelope pillow covers. I didn't want to use zippers because of the moisture, but I wanted to be able to remove the cases for laundering over the winter. I also made a new seat cushion cover for one of the chairs. You might remember this chair. It comes from very humble beginnings. I made it all pretty here. But a lot of rain gets on that side of the porch. And none of those pillows or fabrics were weather resistant. 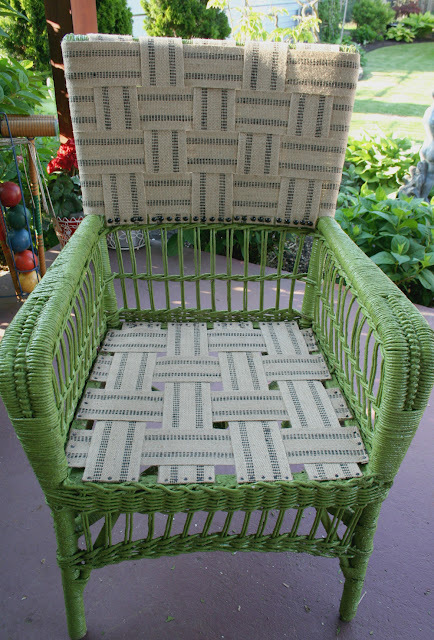 And that upholstery webbing, well that colored thread fades right out after over a summer of sunshine and rain. So I redid it again. And put it on the back porch, where not QUITE as much rain gets through. 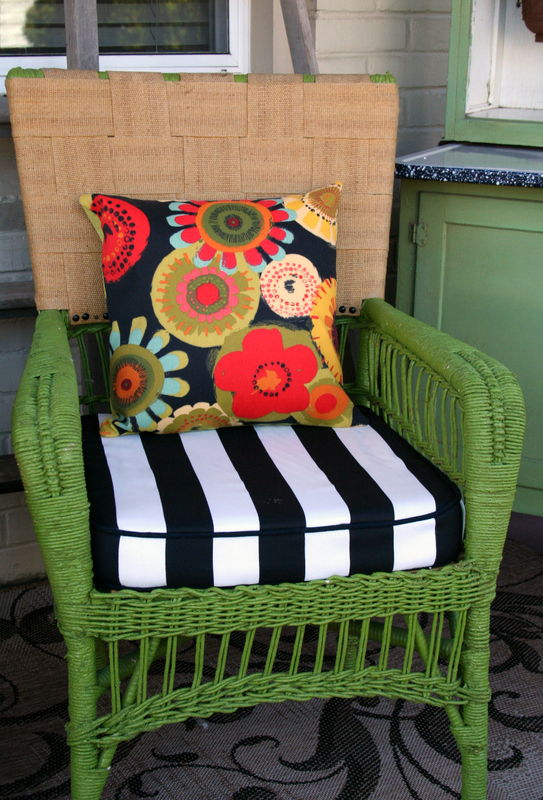 I covered the cushion with a green quilt and left it that way for the summer. The squirrels ate through the quilt and into the batting covering the cushion. So I decided to make the cushion cover to go with my mix and match pillows. 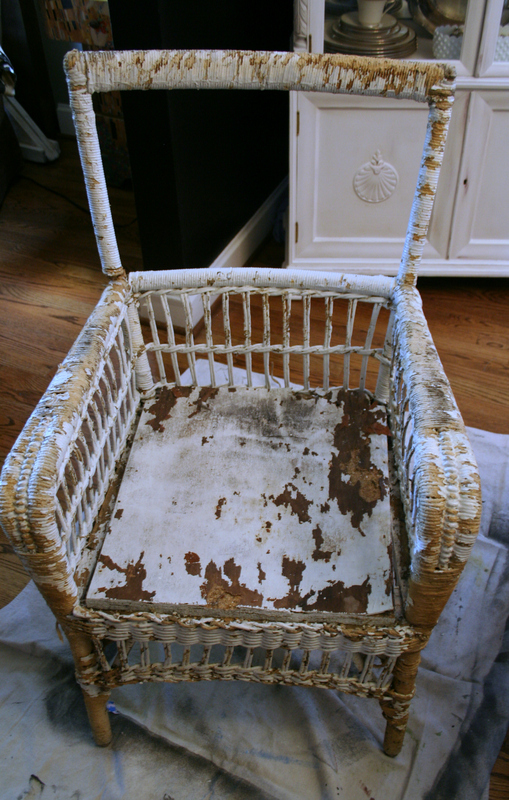 Notice that even though the chair was tucked away in the corner for last summer, the webbing still faded. I'm considering drawing the color back in with a Sharpie. I like the way it looks when it shows. I'm pretty much digging the way it everything turned out. 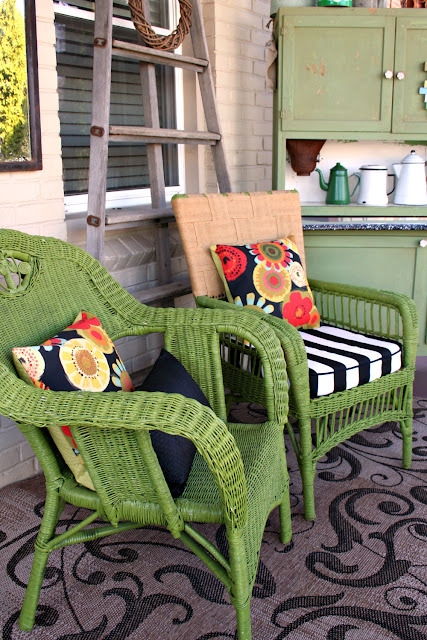 I have two more wicker chairs that need to have the upholstery redone, plus three benches out in the yard that need some attention so I'm not even close to finished. That funky floral fabric is dear to my heart. And of course I love the black and white stripe. Because, well, it's black and white. I'm anxious to get to use more of both of them. I used scraps of some green outdoor fabric from another project for the backs of the pillows. That's because I'm cheap. I get more pillows if I only make one side of the fancy fabric. Plus it's more mix and match that way. 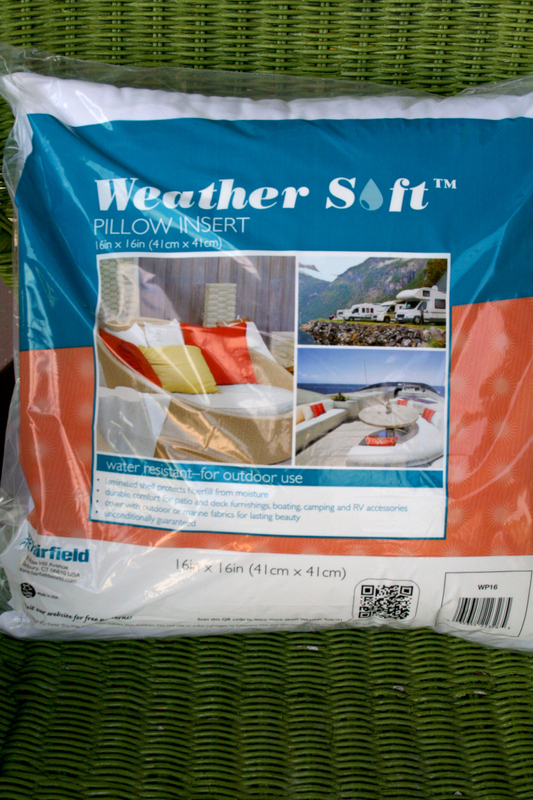 Fairfield also makes Weather Soft cushions and Shield pillow covers that you can use to make a regular pillow form water resistant. It also serves to make the cushion allergen free. They sell packages of the Shield fabric that you can use to make your own pillows or crafts. They recommend layering it under fleece and other fabrics used to make stuffed animals and other items for babies and children. They make thermal fabrics that can be used to keep things warm or cold. I've had a piece of one of their thermal fabrics that I bought to make pot holders for at least 6 years! I need to use that! And just one more thing about Fairfield . . . if you have a need for which you can't quite figure out which of their products would be best, just go to their website and contact them. Tell them what you need and they will be able to tell you what they can do to help you. I want to say thanks to Fairfield for contributing to the success of my project. And thanks to our hosts for the March contest, Colleen at 58 Water Street, and Charlotte at Ciburbanity. Head over to their place and see what they've done to mix & match. All the other contest entries will be linked there as well. This month's contest is open to the 35 entrants who signed up on the Facebook member page. If you are interested in participating in future months, please email info@fabfurnitureflippincontest.com for details. So that wraps it up for me. I hope you will check out some of the other projects. Tell me what you think of my funky fresh floral fabric! 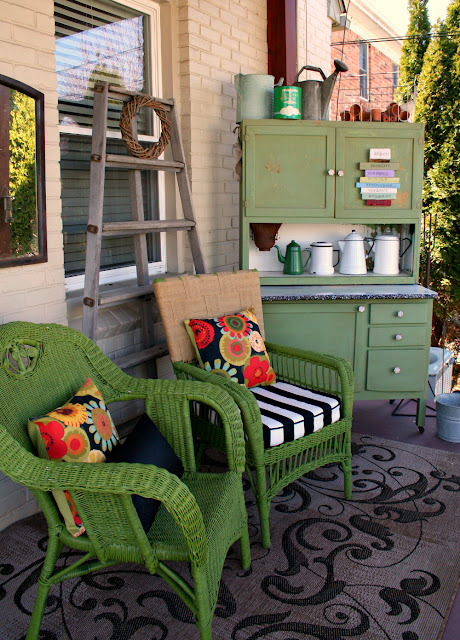 LOVE the green wicker and the bold fabric! I love the green and your pillows are great! Love your chair and the pillows. I haven't seen those outdoor pillow forms. Will check them out. Love your funky fresh fabric!! The chair is like a cat, it's got nine lives!